The novels of Jane Austen are filled with conversation - with chatter, gossip, speculation and homily. But in Persuasion, the central character scarcely speaks during some of the most important scenes. Anne Elliot, having arrived at the advanced age of 27 still a spinster, is more or less denied a role in the rigid social hierarchy of her time. She is the most intelligent of women, and the only one in her family with common sense, but in her circle, marriage conveys a license to talk in society, and she has not the license. Anne (Amanda Root) is almost severe. Her face is often drawn up into serious expressions, as if she is meditating on the stupidity of those around her, and the likelihood that she will have to spend the rest of her life attending to them. Once, eight years ago, she was in love. But the man, Frederick Wentworth, was a naval officer with no fortune. Faced with such a dilemma, a girl turns to her mother, but Anne's mother was dead and her father a fool, so she heeded Lady Russell, a neighbor, who advised her that such a man was not the right match. Now there has been no match at all, and Anne sits patiently at tea. Her father and older sister have lived so extravagantly that they will be forced to rent the family house. They will have to "retrench," says Sir Walter Elliot (Corin Redgrave), with a bitter taste in his mouth. The house will be let to Admiral Croft. The admiral comes to call, bringing with him his wife's brother - who is, of course, Frederick Wentworth, now grown wealthy. So discreet was Anne's relationship with him, so subdued their courtship, so quiet his proposal, so confidential her rejection, that the others fail to notice that her heart skips a beat when he enters the room. Wentworth (Ciaran Hinds) is as quiet as Anne, by choice. He does not mix easily in drawing rooms, and is happier on the bridge of his ship, from which (although the Royal Navy permits captains to bring along their wives) women are banned, along with their chatter. He is the sort of man who stands stiffly in a corner, wishing desperately to be at sea. 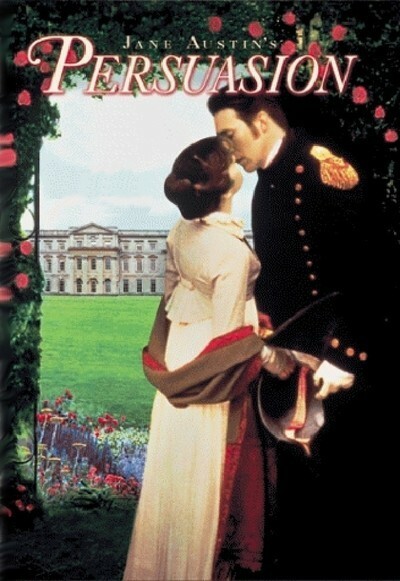 There are so many talkative characters in "Persuasion" that unless you have read the novel, it may take you some time to realize that the story is about Anne and Frederick. After the breakup of the household, Anne goes to visit her married sister Mary (Sophie Thompson), whose convalescence has not curtailed her appetite. Then there is an excursion to Lyme Regis, in the company of Frederick and other friends and relatives. The group visits Wentworth's old friend, who is heartbroken after the death of the woman he loves, and Anne speaks tenderly and sensibly with him, while Wentworth observes. During all of this time, there has scarcely been a meaningful word between Frederick and Anne; each thinks the other is, in one way or another, engaged. We know what we want to happen - what must happen, given the conventions of the time and the inclinations of Jane Austen. We know they must be married and redress the great wrong of eight years before. But everything conspires to prevent that. Anne's silly cousin William (Samuel West) also seems to be a suitor for her hand - and to Frederick, not easy in the ways of romance, it seems of course that he must win it. One of the best scenes in the movie takes place in a tea shop in Bath, where Anne and Frederick at last meet, by chance, and it appears he will have his chance to walk her home, before William appears, and Frederick withdraws without a fight. "Persuasion" has been directed by Roger Michell not so much like a "Masterpiece Theater" production, which is what we might have expected, as like a matter-of-fact record of the events under study. In that he reflects Austen's tone. The details are right (in particular, we notice how dark the houses are), but this is not a costume piece; it is a film about two people who are shy and proud, and about a process of mutual persuasion that takes place between them almost without a word being spoken on the real subject. Everything depends on Amanda Root and Ciaran Hinds in the key roles, and they are well cast as people who might not be everybody's idea of perfection, but are each other's. All of society seems arrayed against them - not through prejudice, not through ill-will, but through inhibition and hateful ground rules that prohibit them from speaking easily about the only subject that interests them, their future together. Much of the movie's emotional work has to be done by their faces and eyes, while other people speak of other things, and to see that happening is frustrating, because it happens so slowly, and romantic, because it happens at all.